GoodReads Summary: A dog with a ball is one of the most relentlessly hopeful creatures on Earth. After his best little-girl pal leaves for school, this dog hits up yoga mom, baby, and even the angry cat for a quick throw. No luck. Forced to go solo, the dog begins a hilarious one-sided game of fetch until naptime’s wild, ball-centric dream sequence. The pictures speak a thousand words in this comic book-style ode to canine monomania. Ball? Ball. What I Think: I'm so excited about this book! I think dogs make the best kind of pets and I love to see their fun personalities come through in picture books. 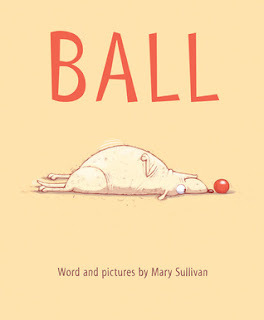 We cracked up as we read this book and imagined what the dog was thinking throughout the story. As a basically wordless picture book, the story is told primarily through illustrations. The only word "spoken" throughout is ball. I immediately thought of Doug from the movie Up. That's the dog whose attention is captured any time he thinks there is a squirrel nearby. Love that movie, love that dog. Squirrel! Ball also reminded me of an activity I did once in high school about communication and body language. In pairs, we took turns having a conversation with only the words yes and no. The idea is that through body language and inflection, we can convey a message. This is a great activity in fluency because it becomes clear to students that how they say the words is just as important as the words that are being said. It can also be a great writing activity because a challenge in writing is to show instead of tell. Dialogue can be so important but also describing what a person is doing when he or she is talking can help give the reader a clear image of what is happening in the text. I'm envisioning this book in a bookstack with the other books recommended below and it makes me super excited! I love writing about pets with kids...it seems like every kid either has a pet, has had a pet (Wah! ), or desperately would love to have a pet. Before I had my kids, I wrote lots of persuasive pieces with my students so they could help me try and convince my husband that we needed a dog. (We were never successful in changing his mind...although we did convince my students' parents a few times!) I adore each of the books below and how they bring pets or animals to life. And a bonus, no dogs die at the end of these books! Score! On the contrary, they are sure to bring a smile to kids' faces and make for an opportunity to compare and contrast the stories. You could look at how illustrators bring the stories to life, how the stories are told from different perspectives, how in some books the animals are personified while in others they are not. So many things to do and so many ideas for reading and writing with all of these texts. Stopping to imagine the world from someone else's shoes is so especially imperative in writing. This story gives kids a reason to imagine what the do might be thinking and then what the little girl might be thinking. Actually, kids could also imagine what the mom and the little baby is thinking in the story, too! After imagining what he or she might be thinking, students can try writing from different perspectives. Mary obviously chose to tell the story from the perspective of the dog, we never get to see the world outside of the house and it would be a great discussion to have with kids about why she might have decided to do that. There is just so much that can be done with this text and by matching it with other texts. So fun! Writing Prompts: Write about a time in your life when you were anticipating something exciting that was going to happen and how you felt. Choose one scene and describe the dog and what he is doing. Make sure you show, don't tell. Pretend you are the dog in the story and write what he is thinking at one point in the story, then pretend you are the owner and write what she is thinking about while she is at school.